“The Creator is the creature’s home. Neither spirit of angel nor soul of man can rest short of God. They can anchor nowhere save in the capacious harbor of HIS Infinite perfections. All things teach us this beautiful truth. All things that find us wandering lead us home again to the Bosom of the Eternal Father…. God is our Last End as well as our First Cause. O that the day were come when we shall be securely at His Feet forever!” (F.W. Faber, The Creator and the Creature, p.343). When is the last time you rested in God the Father’s love? When is the last time you sat, so to speak, on His lap (to use an image from Saint Therese of Lisieux she drew from Isaiah 66:12) just soaking in His eternal love for you? 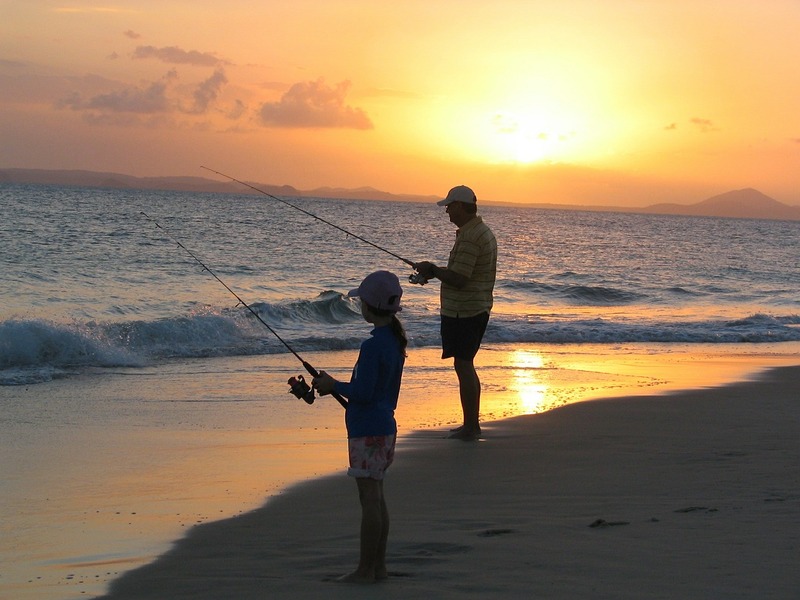 It is in the Father’s Heart that we find green pastures and still waters: it is in Him that we renew our soul. God is the Eternally Good Shepherd. Like me, you’ve probably prayed the Our Father a gazillion times, but have you ever stopped just for a moment to rest in the wonderful truth that God really is your Father? He made you. He has known and loved you with an everlasting love (Jeremiah 31:3); and He loves you with the full might of a God Who Is Love (1 John 4:8). We are truly His children (1 John 3:2). Amazing, but true! It is a breakthrough in the spiritual journey, as Father Faber points out, when we first begin to allow ourselves to be loved by God. God is Infinite love. We sometimes run from Him, or fear that we are not worthy of His love. But since He allows us to call Him Father, we can rest assured that He loves us with an “indescribable” love. As Saint Augustine said, “God made us for Himself, and our hearts are restless until they rest in Him.” Jesus has brought us home to the Father. Saint Francis de Sales calls this resting in God the love of complacency. Since God is Infinite Goodness and Infinite Love, our true rest and delight is in Him. Father Faber defines the love of complacency as “being content with God. It not only wants nothing more, but it only wants Him as He is….Complacency fixes its eyes upon what it knows of God with intense delight and with intense tranquility. It rejoices that HE is what HE is. It tells Him so. It tells [Him so] over and over again. Whole hours of prayer pass, and it has done nothing else but tell Him this” (p.183). In his Treatise on the Love of God, Saint Francis de Sales says, “He is the God of our heart by this complacency, since by it our heart embraces Him and makes Him its own: He is our inheritance, because by this act we enjoy the goods which are in God, and, as from an inheritance, we draw from it all the pleasure and content: by means of this complacency we spiritually drink and eat the perfections of the Divinity, for we make them our own and draw them into our hearts” (Chapter 5). “Delight yourself in the LORD; And He will give you the desires of your heart” (Psalm 37:4). Prayer is an invitation to rest in God. In prayer, God allows us to take refuge in His “incomprehensible goodness”. And if it is true what the spiritual writers say, that we become more and more like that which we love, what a thought! : to become more like God! What joy we will experience resting in the “incredible sweetness” of God the Father’s love for us! When we rest in Him, will we not be tempted to say, like the King in The Song of Songs, “How beautiful you are, my beloved, how beautiful you are” (1:15). Sources: Saint Francis De Sales, Treatise on the Love of God; F.W. Faber, The Creator and the Creature; Beverly Courrege, Because of the Cross. Saint Therese of Lisieux saw in Isaiah 66:12 an invitation for a little child to be rocked upon the lap of God (see The Way of Trust and Love, Page 10, by Father Jacques Philippe). Key idea: Methods used by the saints to increase their love of God. The method discussed here is the love of complacency. We should remember that God dwells within our baptized souls as long as we are in sanctifying grace. Image: Damiane. 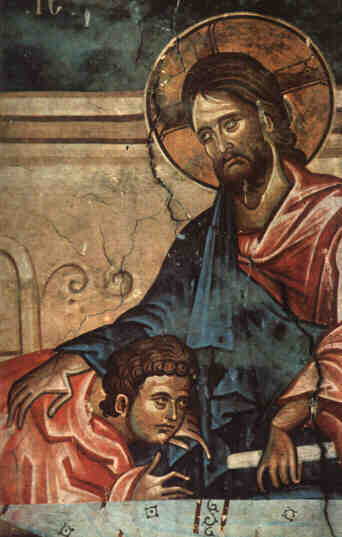 “Jesus Christ and St. John the Apostle”. A detail of the Last Supper fresco from Ubisi, Georgia. 14th century. At Wikipedia. Public Domain, U.S.A.
Book Recommendations: A short and instructive book on interior prayer is Time for God by Father Jacques Philippe. Any ads following this note are by WordPress and not CatholicStrength. Both the Gospels of Matthew and Mark record the miraculous feeding by Jesus of the 5000, and then later, the 4000. These separate miraculous feedings have profound significance regarding the international dimensions of Jesus’ Kingdom. The feeding of the 5000 is to Israelites living within the Promised Land. Thus, there are 12 baskets of leftover food symbolizing the 12 tribes of Israel. The Gospel is taken first to the chosen people. See Matt. 14: 13-21 and Mark 6:32-34. The feeding of the 4000 is to Gentiles living outside the promised land (in the Decapolis; see Mark 7:31). Thus, there are 7 baskets of leftover food representing the seven Gentile nations that once occupied the land of Canaan. 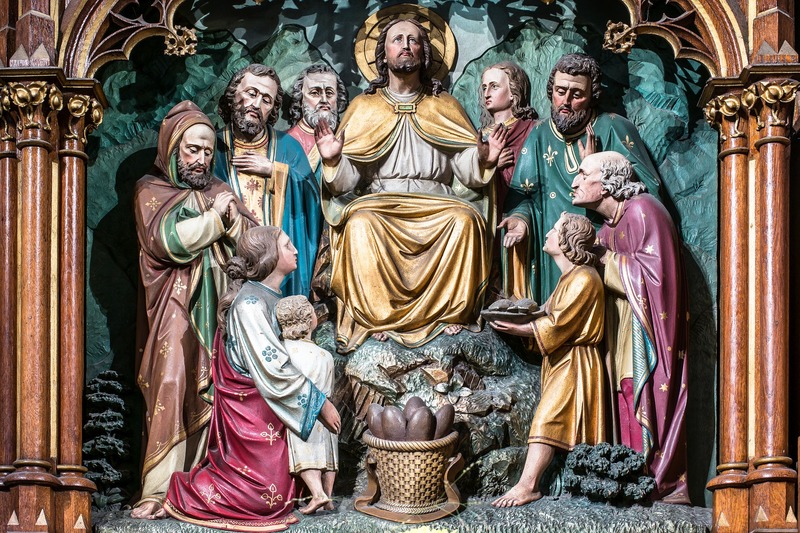 The significance of these two miraculous feedings is clear: the Kingdom established by Jesus is catholic – that is to say, universal, international, for all peoples, for all nations. In-between the two miraculous feedings of the 5000, and then the 4000, Jesus healed the Syrophoenician woman’s daughter. She is the Gentile woman who told Jesus, “Yet even the dogs under the table eat the children’s crumbs” (Mark 7:28). Thus we see that “Israel’s leftover bread will be given to the Gentiles” (Ignatius Catholic Bible Study, page 79). “When I broke the five loaves for the five thousand, how many basketfuls of pieces did you pick up?” “Twelve,” they replied.”And when I broke the seven loaves for the four thousand, how many basketfuls of pieces did you pick up?” They answered, “Seven.” He said to them, “Do you still not understand?” (Mark 8:19-21). To conclude, “All men are called to belong to the new People of God. This People, therefore, while remaining one and only one, is to be spread throughout the whole world and to all ages in order that the design of God’s will may be fulfilled: he made human nature one in the beginning and has decreed that all his children who were scattered should be finally gathered together as one. . . . The character of universality which adorns the People of God is a gift from the Lord himself whereby the Catholic Church ceaselessly and efficaciously seeks for the return of all humanity and all its goods, under Christ the Head in the unity of his Spirit” (Catechism of the Catholic Church, no. 831; LG 13). Yes, indeed, we are called to evangelize – to share the Bread of Life with all people. “Jesus said to them, ‘I am the bread of life; whoever comes to me shall not hunger, and whoever believes in me shall never thirst’ ” (John 6:35). Reference: I am relying completely on Scott Hahn’s audio Bible study of The Gospel of Mark available from Saint Joseph Communications (refer to the second CD). I have merely tried to summarize in a concise manner these points made by Dr. Hahn. See also The Ignatius Catholic Study Bible on The Gospel of Mark. Note: as is well known, these miraculous feedings included the multiplication of the loaves and fishes. Patience is a huge – indeed critical – virtue in the spiritual life and for life in general. 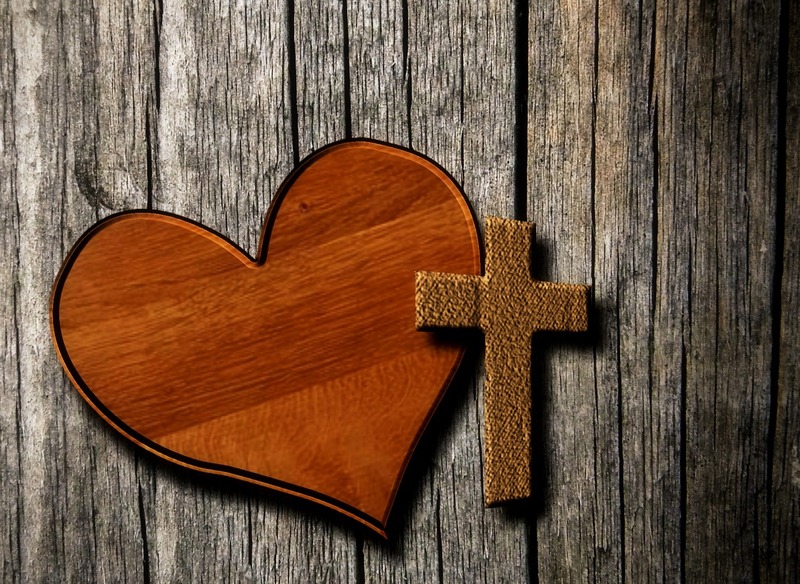 Consider St. Paul’s description of the many characteristics of love – the first thing he says about love is that it is patient, and the next thing he says is that it is kind (1. Cor. 13:4). Dear God, give me the grace to be patient and kind and I certainly will grow in charity! Here, then, by the practice of patience, is a simple yet profound way to grow in holiness. To be sure, growth in holiness means, as already mentioned, growth in the love of God and neighbor. All the virtues, including patience, are directed to the fulfillment of Christ’s law of charity. “For all the law is fulfilled in one word: Thou shalt love thy neighbor as thyself” (Galatians 5:14). So this simple method to grow in holiness is nothing more (or less) than the exercise of patience under adversity for the love of God. Virtue is tested by the people and circumstances of our day to day life. When, for the love of God, we meet these challenges and adversities with patience and meekness, we grow in holiness and sanctifying grace increases within us (see CCC 1266,which explains that the supernatural virtues – including patience – are given to us in the sanctifying grace of baptism, and nos. 2010-2011 pertaining to the increase of sanctifying grace by way of meritorious acts). The motive for our patience (which is truly a mortification of our self-will) is the love of God, and, secondarily, the love of neighbor. It is this “purity of intention,” as the theologians say, which makes the act of being patient supernaturally meritorious, thus causing sanctifying grace to grow within us, which, as Father Garrigou-LaGrange frequently mentions, can continually increase inasmuch as the precept of the love of God has no limits! Patience is a power – a supernatural virtue sustained by sanctifying grace. Patience is an exercise of the cardinal virtue of fortitude. “Patience, says St. Thomas, is a virtue attached to the virtue of fortitude, which hinders a man from departing from right reason illumined by faith by yielding to difficulties and to sadness. It makes him bear the evils of life with equanimity of soul, says St. Augustine, without allowing himself to be troubled by vexations. The impatient man, no matter how violent he may be, is a weak man; when he raises his voice and murmurs, he really succumbs from the moral point of view. The patient man, on the contrary, puts up with an inevitable evil in order to remain on the right road, to continue his ascent toward God. Those who bear adversity that they may attain what their pride desires, have not the virtue of patience but only its counterfeit, hardness of heart” (from The Three Ages of the Interior Life, Volume II, Chapter 10). Now, my friend, get this! The great theologian and Dominican, Father Garrigou-LaGrange, from whom I am drawing the material for this note, specifically states that among one of the three important signs of predestination (there are more than three) patience in adversity for the love of God is one of them. He states:“Therefore, as a rule, among the signs of predestination are…patience in adversity for the love of God (he names love of the poor and love of enemies as two other such signs)”. See The Three Ages of the Interior Life, Volume II, p.395, which, in context, is dealing with the passive purification of the spirit. Your sure path to holiness and Heaven is patience and meekness under adversity, done for the motive of loving God and neighbor. Father Garrigou-LaGrange mentions that the devil often tempts us to anger, so we should not be surprised if this happens as we try to practice the great virtue of patience. “Love is patient and kind…love bears all things….” (1 Cor. 13:4,23). The corresponding virtue of meekness, says Father Garrigou LaGrange, curbs anger and bitterness. When you feel anger, allow meekness to descend into your anger. To accomplish this goal of patience under adversity, we will need constant recourse to prayer and fervent reception of the sacraments. The practice of examining our conscience at the end of the day (to mark our progress) is also valuable. In the Eucharist, Jesus shares his life and virtues with us. When we receive Holy Communion, we should specifically ask Jesus to help us grow in patience and meekness. Remember, “In your patience you shall possess your souls” (Luke 21:19). Pray for the grace to grow in the all- important virtue of patience. Reference: I am basing this note entirely on The Three Ages of the Interior Life by Father Garrigou-Lagrange. All of my thoughts proceed from this amazing work! Father Faber has an excellent chapter on patience in his Growth in Holiness book, wherein he shows that patience is the “rule” for those of us living in the world. Note that the word “patient” in James 1:4 is also translated as endurance or steadfastness, or one might say, “patient endurance.” According to Father Garrigou-Lagrange, patience is united to fortitude, whereas meekness is united to temperance. The natural virtue of patience, which may be carried out purely for pragmatic reasons, must be contrasted with the supernatural virtue of patience, done for the love of God and neighbor by reason of sanctifying grace (see CCC 1804-1811). According to Father Grou the five essential components of a well made prayer are that it be made: attentively, reverently, lovingly, confidently and perseveringly. Here are condensed and edited comments from Father Grou pertaining to these five qualities of a well made prayer. Reference: My edition of How to Pray by Father Grou is published by The Upper Room. My edited quotes are from pages 32-41, Chapter Three. The book itself elaborates in much more detail on these five essential points and is highly recommended. Note as well that How to Pray is taken from a much larger work of Father Grou called The School of Jesus Christ, a very difficult book to find in English. The quote from Evelyn Underhill is in the forward of How to Pray. The renowned Catholic historian, Warren H. Carroll, who died in 2011, clearly believed in the supernatural origin of the Shroud of Turin. Professor Carroll was especially impressed by the scholarship of Ian Wilson regarding the historical continuity and preservation of the Shroud (see Vol. 1 of the six volume A History of Christendom, where Professor Carroll refers on a number of occasions to the Shroud of Turin in a very favorable manner). But in this note I simply intend to bring to the reader’s attention a very concise summary of two major scientific studies that help to validate the authenticity of the Shroud of Turin. The “primary goal” of the the Shroud of Turin Research Project, Inc., (STURP) “was to determine the scientific properties of the image on the Shroud of Turin, and what might have caused it.” STURP “consisted of a team of American scientists and researchers that spent over two years preparing a series of tests that would gather a vast amount of Shroud data in a relatively short period of time. In October of 1978 the STURP team spent 120 continuous hours conducting their examination of the Shroud. 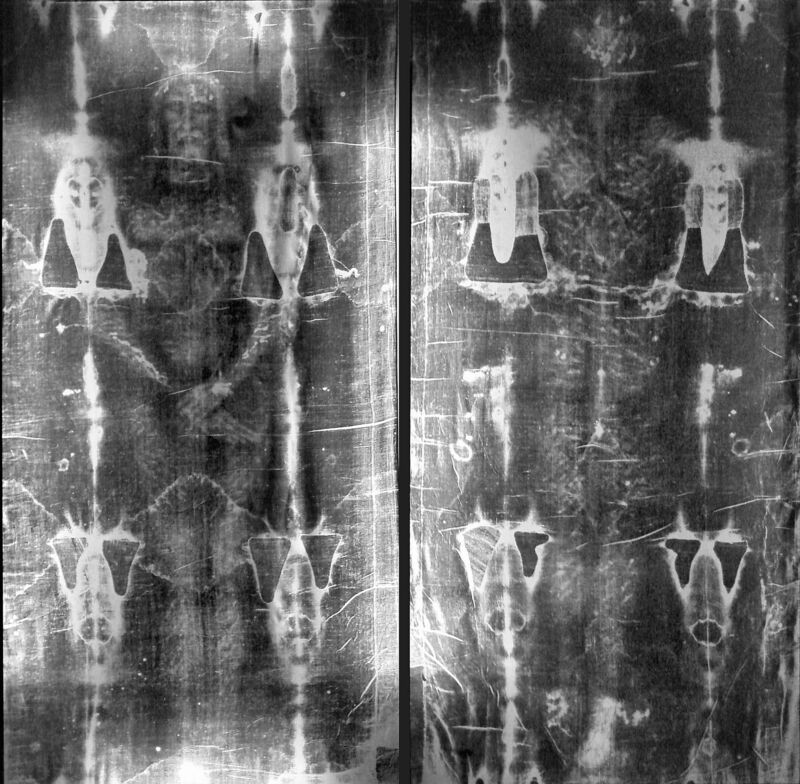 To this day, scientists around the world use the data gathered by STURP for their Shroud research” (source: shroud.com, an excellent site on the Shroud of Turin). According to a National Geographic article on the Shroud of Turin, “the U.S.-led Shroud of Turin Research Project (STURP), …was granted an unprecedented five days of continuous access to the shroud itself in 1978. The project’s 33 members ran the gamut of scientific disciplines, and their credentials included high-level posts at 20 major research institutions. They arrived in Turin with seven tons of equipment and worked in shifts 24 hours a day. An associate team of European scientists acted as expert observers” (from Why Shroud of Turin Secrets Continue to Elude Science by Frank Viviano, April 17, 2015, available online). Here is the official summary of STURP’s conclusions courtesy of a link provided by shroud.com: Summary of STURP’s Conclusions. Relying on quotes from physicist Paolo Di Lazzaro of ENEA, the National Geographic article continues (as placed in italics), stating: The ultraviolet light necessary to [simulate the image] “exceeds the maximum power released by all ultraviolet light sources available today,” says Di Lazzaro. It would require “pulses having durations shorter than one forty-billionth of a second, and intensities on the order of several billion watts.” If the most advanced technologies available in the 21st century could not produce a facsimile of the shroud image, he reasons, how could it have been executed by a medieval forger? For believers, the radiation thesis suggests that a “divine light” in the tomb might have seared the crucified form of Jesus Christ onto the shroud. “One could look at hypotheses outside the realm of science, a sort of miracle,” says Di Lazzaro. “But a miracle cannot be investigated by the scientific method” (end of article). Here is a link to The ENEA team report, which published its findings in 2011. Based on the two in-depth scientific investigations outlined above, namely, the STURP study and the ENEA study, it certainly does not appear that the image on the Shroud of Turin was made by human hands. The supernatural origin of this great relic of the Church cannot be ruled out, and even appears now to be the most likely explanation of this scientifically inexplicable image which is claimed to be the burial cloth of Jesus Christ. Image: At Wikipedia, Public Domain, U.S.A.
“All the good we do,” says a great spiritual writer, “Jesus Christ does in us.” Accordingly, “we may say that [Jesus] has done, in a manner, all the good works of the Saints….” Thus, “when we keep the feast of some Saint, we keep the feast of Jesus Christ, who is the author of all the sanctity of the Saints” (Father L. Lallemant, The Spiritual Doctine, p.262). Another great spiritual writer, Father Weiss, tells us that in “His Merciful Providence God sent each saint to remind the world of its duties and to save it from its corrupt life. The saints…are selected as instruments of salvation by the compassionate Doctor of the nations [Jesus].” For “those who receive the saints, they are a great means of salvation. A people will never fall hopelessly into corruption as long as they have a single saint” (The Mystical Evolution, Vol. II, p. 373). The great Father Olier adds:”In a certain sense the Feast of All Saints seems to me to be greater than that of Easter or the Ascension because this mystery perfects our Lord. But Jesus as Head is not perfect except in union with all His members, who are the Saints. This Feast is very glorious…for all the excellence of the perfection of the saints is nothing more than an emanation of His Spirit poured forth on them” (Id at 501). Father Weiss explains that “the saints have always been the most faithful sons of the Church….The more united anyone is to the Church, the more certain he is of union with her Founder and Lord, the author of all graces and the model and end of all sanctity. The more tightly one is bound with the mystical body of Jesus Christ, the more he adheres to this divine Head….” (Id at 485). “The honor of God …is deeply implicated in the worship paid to the saint. In some sense [God] is more jealous of it than of His own; less patient of levity with [His saints] than with Himself, and frequently punishes persons for this [levity]. The saints themselves have entered into the dispositions of God, and, with a sort of vindictive holiness, hard for us in our present state to understand, resent familiarities and impertinences…. Faith is the chief ingredient in a true devotion to the saints; faith is the reality of their power, and of their relationship towards us. It is a great sign of a man being supernatural when he fears to offend a saint. The favors of the saints form a great department of the Divine Mercies, and play an important part in the sanctification of holy men…. Weakness of prayer is one of the feeblenesses of our times, through want of faith and fear; this is one way to set them right. We always fear those in whom we have confidence. We cannot ever put confidence in those whom we do not in some way fear” (From: Notes on Doctrinal and Spiritual Subjects, Volume I, pages 381-82). PRACTICAL RECOMMENDATION: Here is an instance where modern technology is truly advantageous. Since devotion to the saints gives glory to God, it is sage advice to put a high premium on devotion to the saints! I might add that two modern saints of extraordinary significance indicated that they intended to do a lot of good for us in the church militant once they got to Heaven (i.e., the Church Triumphant) – and these two saints are St. Therese of Lisieux and St. Faustina Kowalska. “Love never remains idle.” So here is how this simple devotion works. You have the “Saint-of-the-Day” email sent to your email account. I use the Saint of the Day email from franciscanmedia.org. You open the email and read the short bio of the Saint of the Day, paying attention to that saint’s particular spirituality and virtues (learning to imitate the saints, according to your own life situation, is one of the best things you can do!). You then thank that saint for his or her awesome service to Jesus and his church, and you then petition that saint for a share or increase in one or more of the virtues that saint exemplified during his or her life (such as fortitude during trials, devotion to the poor, perseverance in prayer, kindness to enemies, great devotion to the Holy Eucharist, etc). Devotion done…much learned…fresh graces merited! God honored. You will be blessed by this devotion. “God is great in His saints” (see 2 Thes. 1:10). Remember, in a very real way, the Feast Day of a Saint is the Feast Day of Jesus Christ. Glory be to God for the Saints! P.S. In addition to the internet, the Church Calendar will also tell you the name of the Saint whose Feast is being celebrated on a given day. I try to look at my wall calendar when I get up in the morning. The next Saint Feast Day on my calendar is St. Hilary, an early Bishop, on January 13, followed a few days later by the great Saint Anthony. Do you think Saint Anthony could help you? 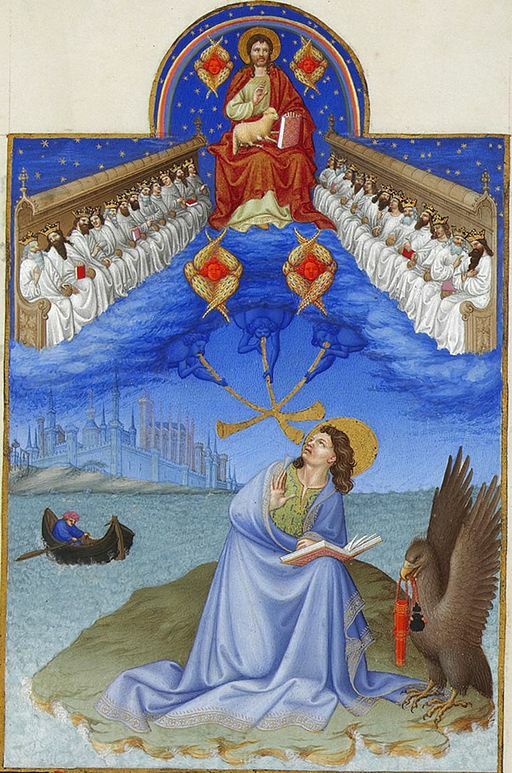 Image: Saint John on Patmos by the Limbourg brothers. Date: between 1411 and 1416. According to Wikipedia, “Rev. 5:8 presents the saints in heaven as linked by prayer with their fellow Christians on earth.” Public Domain, U.S.A.
[The] story of my soul…involves me in only one thing: to start extolling now the mercies of the Lord – which I shall go on doing throughout eternity.” (Image, p.19). In the person of Jesus Christ we have received a hope and a gift we never deserved. And yet, through the Merciful Love of God, Jesus belongs to us. In a path marked by the incredible mercy of God, Saint Therese communicates this message to us. 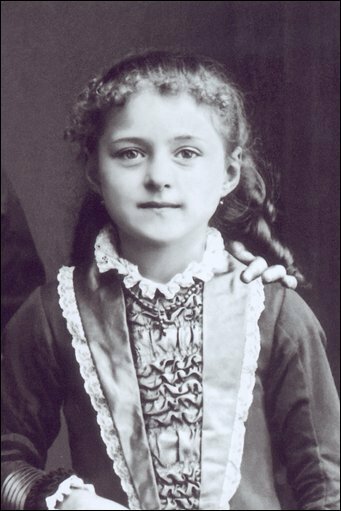 Image: Picture of Saint Therese, Public Domain, U.S.A. The Kingdom of the Incarnation is built on purity. “Since all God’s works are a disclosure of Himself,” we can look backwards to the commencement of the Kingdom of the Incarnation to see that, by the overwhelming weight of the evidence, Christ’s Kingdom is built on purity (we cannot deny that God’s love is an even deeper foundation for this Kingdom, but love and purity go hand in hand). FIRST, we have the Blessed Virgin Mary, whose Immaculate Conception is, in essence, the hidden beginning of Christ’s Kingdom. Jesus chose to enter humanity through the Immaculate one, who is both Virgin and mother. SECOND, we have our Lord himself, the “Celibate Bridegroom,” who is nothing short of INFINITE PURITY. THIRD, we have Saint John the Baptist, Jesus’ forerunner, who is a man of “mighty mortifications” and consecrated to celibacy. FOURTH, we have Saint Joseph, a preeminent model of purity in the church (often depicted in art holding a lily of purity). From these telling facts, we can see very clearly that not only was the Kingdom of the Incarnation built on purity, but that, in fact, this new Kingdom ushered in a monumental purity revolution. From these providential works of God (namely, the persons Mary, Jesus, John the Baptist and Joseph), which came at the very beginning of the Kingdom of the Incarnation, we reach the very important conclusion that the Eternal Father has the highest regard for purity (and thus that purity and holiness are inseparable). Stated differently, God’s Eternal and Infinite Purity shines forth at the commencement of Jesus’ Kingdom (“…God’s works are so many mirrors in which He allows His creatures to behold the reflection of His invisible perfections and hidden beauty….” F.W. Faber). Now, Jesus Christ is the Lord of purity, and he preaches mightily and dramatically about the importance of purity in his Sermon on the Mount. As the Lord of purity it follows that Jesus is also the Lord of Marriage. Jesus demonstrates his supreme jurisdiction over marriage by declaring null and void the limited Mosaic permission of divorce. Moreover, Jesus raises the union of a man and woman in marriage to a sacrament. And any Catholic who understands what a sacrament is thus also understands the surpassing dignity and holiness of the married state! God loves purity (or we might say that God is purity). God’s love of purity is revealed in a dramatic way at the beginning of Jesus’ Kingdom in the persons of Mary, Jesus, John the Baptist and Joseph. Your desire to be pure, despite so many obstacles patent in our culture, is a wonderful sign of your love for God. And if the road to greater purity proves difficult, rest assured that through prayer, devout use of the sacraments of Reconciliation and the Eucharist, and loving devotion to Mary, you will make progress. Sources: The Blessed Sacrament by Father Faber, wherein he discusses how God’s works are a disclosure of who God is (see pages 33-56). It is Father Faber who uses (somewhere) the expression “Kingdom of the Incarnation.” The tone, content and style of this note draws heavily on Father Faber! ; and The Eucharist and Christian Perfection (Volume I) by Saint Peter Julian Eymard (Emmanuel Publications), which is actually a series of retreat reflections he made to the Brothers of Saint Vincent de Paul, but certainly applicable to the laity as well. 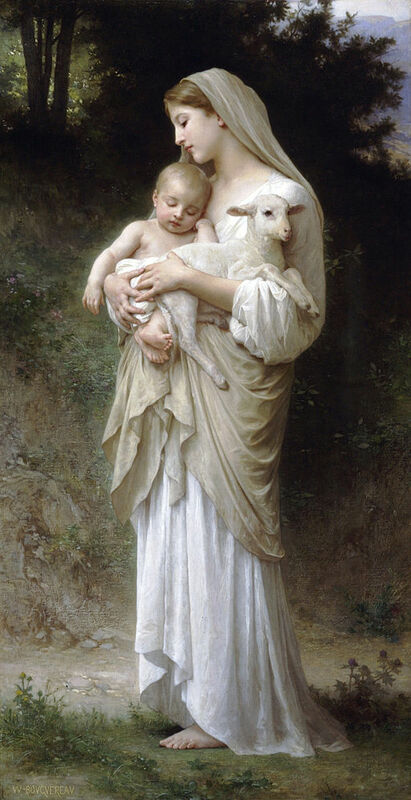 Image: Innocence by William-Adolphe Bouguereau, 1893, (Public Domain, U.S.A.). YOUR NAME, O JESUS, BE FOREVER BLESSED! An easy yet powerful way to grow closer to Jesus is to simply hold His name in great reverence. The basic assumption for this devotion is that Jesus’ name is full of power and grace. The Church apparently agrees with this assessment because it sets aside January 3 as the Feast of the Most Holy Name of Jesus. It is a reminder to us to greatly reverence Jesus’ name the rest of the year. What an awesome New Year’s resolution that would be! Imagine the growth in holiness you would experience if you kept that resolution. 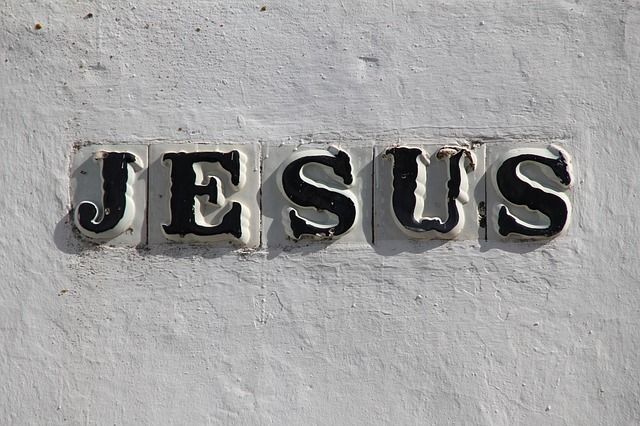 “The frequent repetition of this Divine name [Jesus],” says Father O’Sullivan, will save you from much suffering and great dangers.” It seems to me the key to this devotion is to say Jesus’ name with great reverence and love, calling to mind – without even having to think about it – all that Jesus is and means to us. This is a formula which will clearly increase our love for Jesus and will maintain us in a spirit of faith. We should never forget that faith is one of the most important virtues in the spiritual life (it is a theological virtue, literally meaning “God-directed”). If you are looking for a simple devotion, filled with power, this is it! Father O’Sullivan assures us that the simple devotion of reverently saying Jesus’ name throughout the day has amazing power. And, as Father Faber states, what do we need more in the spiritual life than “power” to overcome our tepidity and weakness. “[Mary] will bear a son, and you shall call his name Jesus, for he will save his people from their sins” (Matthew 1:21). May the most holy name of Jesus be on your lips and in your heart throughout the year.